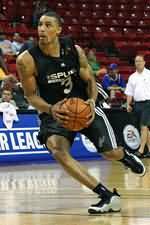 Coach Springer presents these scoring drills used by George Hill of the Indiana Pacers. Diagram A. Hill has increased his range greatly since joining the league. He will take a long three coming off the pick and roll if it is open. 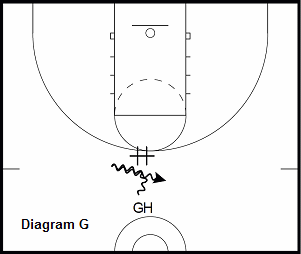 Drill: Use the chair (#) to run a pick and roll into a 3 point shot. Make 20 going in each direction. Diagram B. Indiana runs a lot of flat screens for Hill because of his speed. George will get to the elbow as fast as he can. If a defender is still with him he will make a hesitation move into his drive to the basket. Drill: Use the chair (#) as a flat screen, get to elbow, hesitate into layup at the basket. Make 20 going to each side. Diagram C. George will make a move on the chair and kick the ball to the wing. He will then set a down-screen. 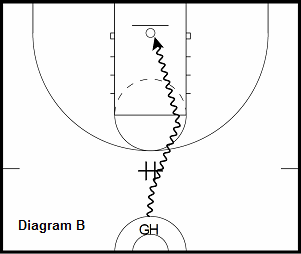 GH will then flash back to the top of the key (diagram D) for a catch and shoot jumpshot. Diagram E. Hill will start the action with a pick and pop. 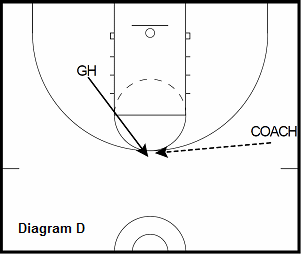 Diagram F. Hill will pass to the pop and come back to the ball for a hand off into a floater in the paint. 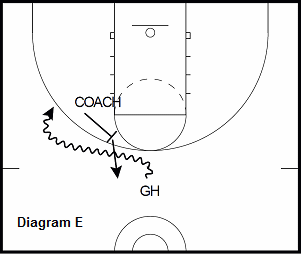 Drill: Go through the sequence and make 15 on each side. 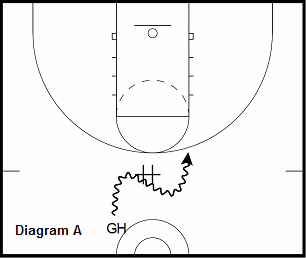 Diagram G. Hill starts to go to the screen and crosses back behind it for a long 3 point shot. Drill: Use the chair (#) for a screen and make the shot. Make 20. 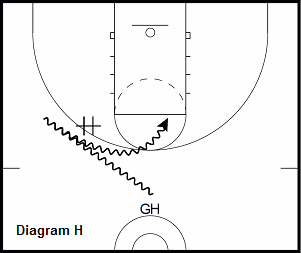 Diagram H. In transition, Hill will push the ball to the wing to set up a "drag" (pick and roll in transition). 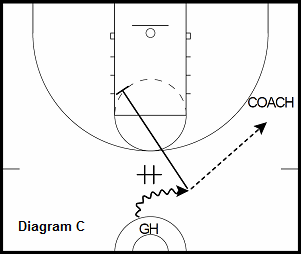 Drill: Start at half court and push the ball to the wing. 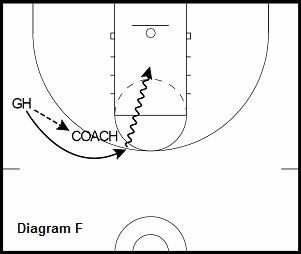 Run off the chair (#) as a screen and shoot at the free throw line. Make 30 on both sides of the court.